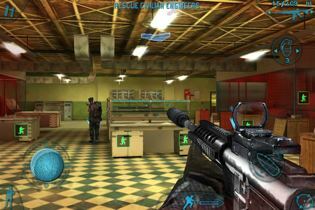 Tom Clancy’s Rainbow Six: Shadow Vanguard Review – Gameloft’s Best iPhone FPS? 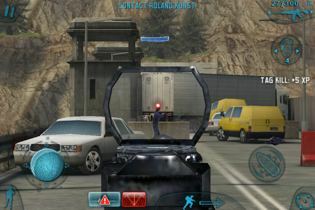 Gameloft has been pushing the limits of iPhone gaming from the very beginning of the App Store. That explains why there is always a bit of excitement in the air when they are about to release a new game. 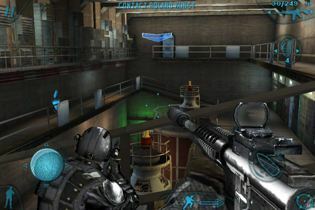 And with Tom Clancy’s Rainbow Six: Shadow Vanguard, Gameloft has yet again released a fantastic iPhone shooter. The Rainbow Six series is famous for it’s tactical gameplay. And while Rainbow Six: Shadow Vanguard is definitely more action focused than the previous parts of the series, its gameplay benefits a lot from some of the tactical elements. You and your 2 AI teammates are asked to stop terrorist activity over the 11 missions of the campaign. 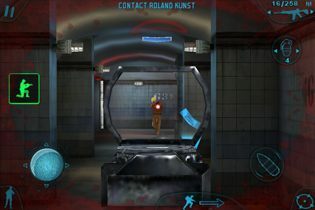 Run and gun does work on the lower difficulty to solve this task thanks to a pretty bad AI, but you will definitely have to plan your way ahead on higher difficulties. I really recommend to play the campaign on a challenging difficulty because that’s when the game started to become a lot of fun. You can peek under doors with a snake camera, mark terrorists and then direct your teammates to clean the room. You can also take cover behind various objects to recover your health and take out terrorists from a safe spot. A very pleasant surprise was the level design. There is always more than one way to approach certain objectives. It gives you a little bit of freedom that makes you feel like you are in charge of how to complete the mission. During the campaign you will gain experience that unlocks new gadgets like a red dot sight that you can then attach to your weapon. The controls are pretty much what you nowadays expect from an iPhone FPS. The only disappointment for some could be that compared to previous releases, Gameloft offers very limited options to customize them to your likes. But this is only a minor setback, the standard controls get the job done very well. Gameloft has improved their graphic engines continuously with every release and Rainbow Six: Shadow Vanguard is no exception. It looks great and offers some nice variety. 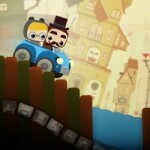 Each level has its distinguish look, be it an oil rig, a village in the Congo or an impressive mansion. What impressed me most however was the sound. A lot of people were complaining about the bad voice overs of previous Gameloft titles. And while the quality was already getting better in Gameloft’s latest releases, they seem to have really focused on it this time around. And the effort paid off. Even the dialogues between some terrorists that you can hear every now and then if you sneak up on them are fun to listen to. I also liked the contextual background music which adds a nice touch to the overall atmosphere. On the bad side are only some strange animations every now and then, especially the one of patrolling guards looks pretty hilarious. While the overall presentation of Rainbow Six: Shadow Vanguard cannot compete with Infinity Blade, it definitely is amongst the best on the App Store. 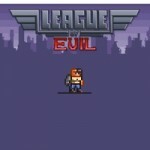 The game also comes with 10 player deathmatch and a co-op mode for 3 players to satisfy your multiplayer needs. Both modes are a great deal of fun and absolutely worth checking out. Rainbow Six: Shadow Vanguard turned out to be a fantastic shooter that you should not miss out on. It’s available on the App Store since last week for $6.99. And if you are still indecisive, check out the gameplay trailer to see it in action.